When race organizers come up with an idea for the winner’s trophy, they have many things in mind. From its relevance to the particular competition, to its significance to the achievement. Some of the biggest events have a widely-recognisable trophy, one that became their brand throughout the years. Not all of them are conventional, to say the least. Especially not the one that Van Avermaet got for winning ‘Hell of the North’. 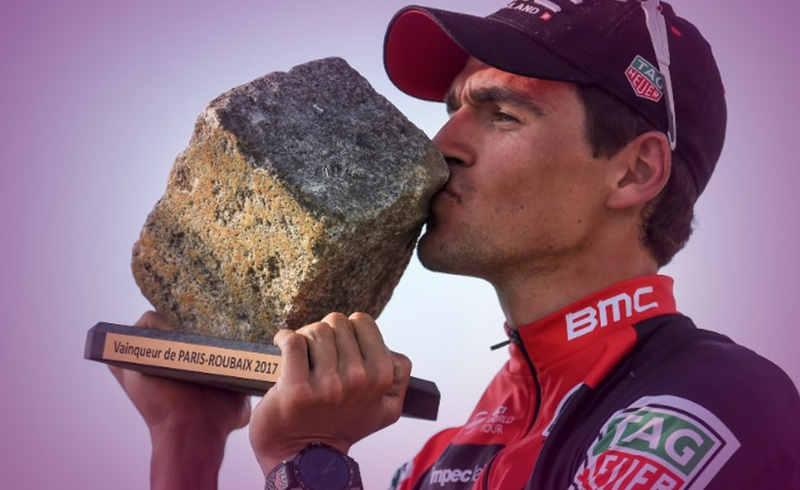 The famous one-day cycling race in France came up with a very unusual trophy for its winners- a rock, but it isn’t just any type of rock. It’s one that represents the blood shed on the actual cobbles throughout the race. It’s also made from the finest materials one could acquire. It is made from the ‘most square’ cobble and then placed onto a plinth. Sounds like what everyone would want as the centrepiece of their trophy collection, right? The 257.5 kilometre cycling tour from Paris to Roubaix is dangerous, tiring and thrilling. What could possibly be more alluring than the fact that you can skin your knees on the cobblestones? To actually win a cobblestone? Many would argue, that this is one of the best things they have ever done. Because it isn’t always about winning, but about the adventure in it all. Let’s honour his victory by asking the cards what’s next for the Belgian cyclist. Will he be the proud owner of other, more conventional prizes? Van Avermaet has everything in his power to achieve further success. He is like the magician, who is in tune with both his inner self and outer forces. Everything is in his favour now. All he needs to do is use his talents wisely. Pure intellectual energy motivates him to reach his goals. There is no stopping him once he sets his heart and mind to something. However, his actions might lack careful planning. Instead, he goes with the flow. His strength, determination and ambition are remarkable. Daydreaming is great, but it won’t lead to future success. There is of course a time for celebration, but then those dreams need to be put to action. If you wish for something great to happen, be careful that it comes with a prize, and not a price.